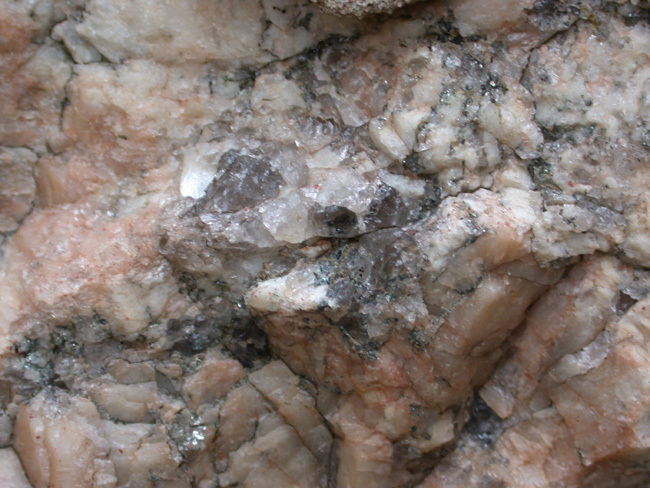 A pegmatitic texture is one in which the mineral grains are exceptionally large. The largest ones are, by convention, more than about 3 cm long. This texture is found in intrusive rocks. The extra large size does not mean that they cooled extra slowly. 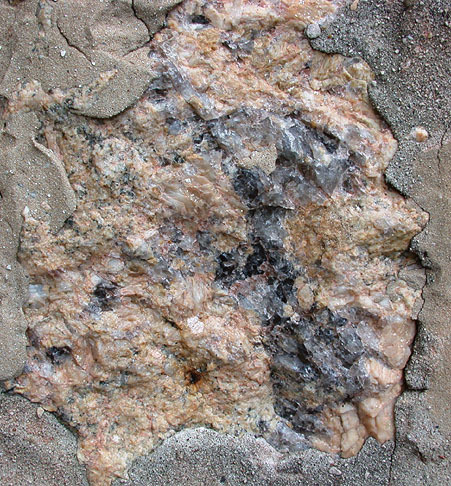 Instead, the large crystals of a pegmatite formed in a magma that was extra rich in dissolved water. The water allowed the necessary elements to diffuse extra fast to the sites of crystallization. 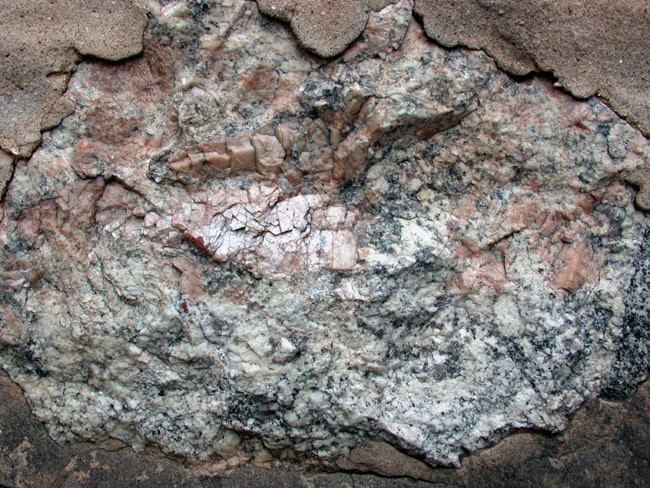 Pegmatites often form in veins that opened up at the end of the crystallization of a large intrusive mass. Most igneous minerals exclude water from their structure, so the last magma to cool often ends up enriched in water and other incompatible elements. Most of the large igneous minerals that are seen in geology labs are from pegmatites. This stone in the Wisconsin barn wall happens to include a bit of a pegmatite running across the upper part of the rock. 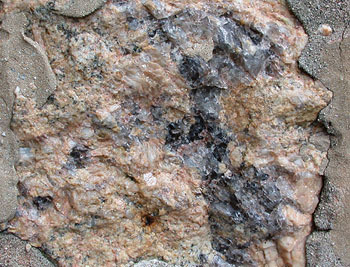 The large pink crystals with the obvious cleavage planes are K-feldspars. 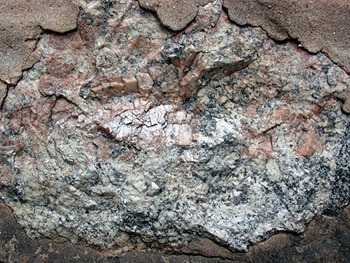 The lower whitish part of the rock does not show a pegmatitic texture. This is a close up of the pegmatitic texture above. There are gray quartz grains near the center and a few feldspar cleavages (pink mineral) in especially the lower right quadrant. The small silvery flecks are muscovite. This is finer-grained than most pegmatites, but the texture is still pegmatitic. 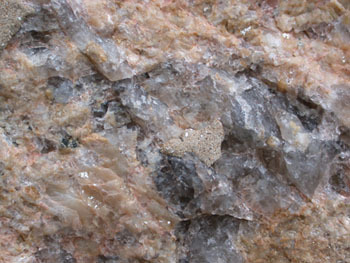 This close-up of the sample above shows pinkish orange feldspar and gray quartz.